New listingVAUXHALL ASTRA MK 3 1.4 GLS AUTO, SHORT MOT, CHEAP SMALL AUTOMATIC, DRIVES WELL! It has a short MOT to the 17th May 2019, the certificate has been misplaced but this can be checked online using the reg number. Mileage is low at just 75,981 miles and it starts, runs and drives. The auto box works and the engine is responsive. This car is in near immaculate condition for the year with just a scratch on the front end. ♦️The spec is endless. ♦️stainless exhaust upgrade. ♦️ immaculate velour interior. ♦️Automatic gearbox. Here we have for sale a 2012 Vauxhall Corsa Exclusiv Ac 1.4 Fully automatic gearbox not cheap and jerky semi automatic. 76K miles on the clock. This is a great looking little corsa with air con and larg trip computer screen. 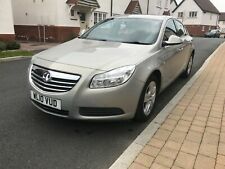 Vauxhall Insignia 2.0 CDTI 160 Exclusive Diesel Automatic 2010 (10) Silver. I’ve done my best to list everything about the car that i know and can see. 12/04/2019 @ 67,066. 07/07/2017 @ 53,587. 29/01/2014 @ 13,214. 2008 Vauxhall Astra Sri. Serv history. 107.000 miles. SPECIFICATION INCLUDING Tinted window with warranty Both front coil springs changed within last year. New battery. Full service history. REMOTE CENTRAL LOCKING. ELECTRIC WINDOWS. Lovely Vauxhall Astra estate, rare diesel auto. Drives superb, se model, so well equipped. Just put a new MOT on the vehicle, expires 20/04/20. Available to view in Milton Keynes. Interior is clean, little bit of wear on the drivers seat, on the half leather, where you get in and out. FOR SALE Vauxhall zafira 1,9 auto Diesel 2009. M.O.T. 16th November 2019. Automatic windows & mirrors, air condition. Drives smoothly, engine works perfectly, gearbox changes gears smoothly. Everything in good condition. Gorgeous car, lovely to drive very smooth. Starts and drives lovely. Full years mot. One small dent on the front as pictured approx 4cm wide but should be able to pull out with dent fixer or via panel beater. It is a 62 plate 2013 model. Full service history. MOT till 13/08/2019. It is nice and clean. Vauxhall Astra 1.6i VVT SE. MOT UNTIL FEBRUARY 2020. AUTOMATIC CAR FOR THIS PRICE. Here we have a 2011. 5dr Hatchback in Silver. CELEBRATED 10 YEARS. and for this reason, most cars are sold. I try to pick cars that i would be happy to drive round in myself. Vauxhall Astra 1.6 petrol automatic. VEHICLE HAS PARKING SENSORS. SMALL SCRATCH ON REAR BUMPER. North East’s largest salvage operators. Vehicles can be removed early due to being advertised elsewhere. All of the features inside are in working order, all 4 tyres are safe and have very good tread on them. the car drives nice, it has no knocking or banging ect. the automatic gearbox is smooth and changes through all the gears nicely with no excessive noice at motorway speeds. LEFTHAND DRIVE LHD FRENCH REG ZAFIRA 7 SEATER AUTOMATIC. LHD LEFT HAND DRIVE. VAUXHALL / OPEL ZAFIRA AUTOMATIC. A REAL NICE CAR TO DRIVE. VERY VERSATILE CAR LOTS OF DIFFERENT SEAT COMBINATIONS. FACTORY BUILT IN SAT NAV. CENTRAL LOCKING. Silver, Vauxhall Corsa SE 3 door, 1.4. 2010. Automatic. Low mileage! Rare automatic with only 50602 miles! First to see will buy. Ideal 1st or 2nd car, currently a lady owner. 2008 08 VAUXHALL ZAFIRA 1.9 CDTI DESIGN OPTIONS INCLUDE BUT NOT LIMITED TO DRIVES FAULTLESS WITHOUT ANY WARNING LIGHTS ON DASH DOESNT MISS A BEAT CLEAN & TIDY CAR FOR AGE SORRY NO PX HPI CLEAR CLEAN 7 - STR. CALL US ON 07722004437, Next MOT due 06/01/2020, Clean bodywork, Interior - Clean Condition, Tyre condition Good, 5 seats, Red, 4 owners, Air-Conditioning, 17in Structure Wheels with 225/55 R17 Ultra-Low Profile Tyres, CD 300 - CD Player with MP3 Format/Stereo Radio and Auxiliary-In Socket, Cruise Control, Driver Information Centre, Electrically Operated Front Windows with One-Touch Facility, Remote Control Security Alarm System, Single-Zone Electronic Climate Control (ECC) Incorporating Air Conditioning, Tinted Glass. VAUXHALL CORSA SE AUTO 1.4 2013 4 DOOR PETROL. THIS IS NOW SOLD. regularly maintained. There is a tear that has been repaired in the drivers seat lower right hand bolster. CSS Ltd. - Call us on 441329559705 or click here to find out more. Vauxhall Astra SRI. Astra J (2011). Starts for loading purposes only. MoT to Sept 2019. 2011 Vauxhall Insignia Estate 2.0 Diesel Automatic. Well equipped with electric windows, air con, remote locking. 1 Previous owner, 152k miles, full service history (inc cam belts). 2.8 v6 turbo excellent condition interior. blue 101000 miles HALF LEATHER! AUTOMATIC!